My brother, who is known to always stir the pot, will impose preposterous hot sauce challenges to his nephews and nieces. A typical dare: “I’ll give anyone $50 if you eat this huge spoonful of straight hot sauce.” The kids’ eyes will widen, and right before they’re about to accept his stupid offer, he’ll add at the last second: “And you can’t drink any water afterwards for 24 hours.” Mayhem unleashes. “Crazy! Unfair! You can’t do that!” We’ll spend the rest of the dinner debating if he could technically add on that stipulation at the very last minute, and then we’ll analyze if your body could physically survive all that hot sauce intake without water for 24 hours….and the dinner would just digress from there. In the spirit of not wasting a perfectly good cow tongue, why waste a bounty of serrano peppers when you can make something with them (coincidentally, with soy sauce and sesame oil)? This recipe is very easy and very spicy. Store your jar of hot sauce in the refrigerator, and it will last forever. Okay, maybe not forever. But it’s so spicy, a little goes a long way. Just remember to stir the jar well each time before use to distribute the pepper seeds evenly. It will enhance everything you eat. Even cow tongue. Maybe I'll challenge my brother to eat a whole cow tongue at our next Sunday dinner. Without water, OR hot sauce. Serrano peppers are sold by the package at my local Chinese grocery for just $1.99. About 2 cups of whole peppers will reduce to about 1 1/3 cup when finely chopped. Caution: Pepper seeds will start popping everywhere, but refrain from touching them with your bare fingers (or wear gloves). Tip: (assuming you’re right-handed): while holding the stem of the pepper steady on the cutting board with your left hand, start cutting from the opposite end of the pepper. With this method, you will never need to touch any seeds. That’s how mama Dragon Lady taught me how to do it! Finely chop serrano peppers (discard the stems). Place chopped peppers, including all the seeds (about 1 1/3 cup), in a large, sealable jar or glass container. Add soy sauce and sesame oil. Mix well. Store in refrigerator. Just last weekend, my mom and I were watching my son’s baseball game at the neighborhood park. It was late-afternoon, I hadn’t had lunch, and at the top of the last inning, mom casually mentioned, “I made a pot of noo-roe-mein. Want some?” Yummmm…I started counting down the strikes to my 1½ block walk to another noodle homecoming at mom’s. It was then that I decided this had to be my next recipe. The Dragon Ladies, at the baseball field last week, right before going home for some beef soup noodles! One of my sisters, who always has a crazy entrepreneurial scheme up her sleeve, has always wanted to channel her love for noodles into dollar signs. One re-occurring fantasy involves starting a Chinese noodle cart at Seattle Mariner’s games or other sporting events. 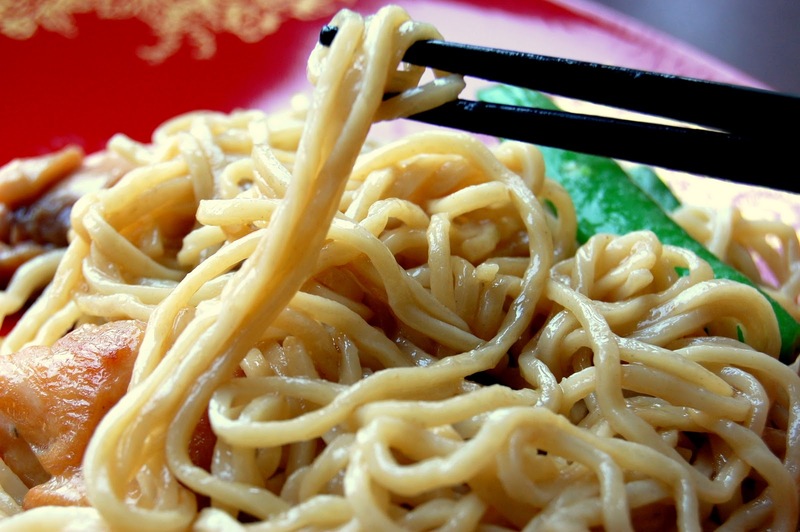 “Lo-mein noodles, noo-roe-mein…people would just love it, don’t you think? We would do so well,” she has repeated. I don’t doubt this, but my sister tends to often wear rose-colored (albeit Chanel) glasses, and underestimates the amount of time and energy that a “great idea” requires to pull off. And guess who would end up doing 98% of the work? Yup, yours truly. So, dear Catherine, I fully support your noodle cart business…from afar. Here’s the recipe to get you started, and I’ll look for you at the next Mariner’s game. In the meantime, who knows….maybe some Dragon Lady Kitchen followers will try this recipe, fall into our noodle spell, and step up to invest. Now that’s using your noodle! 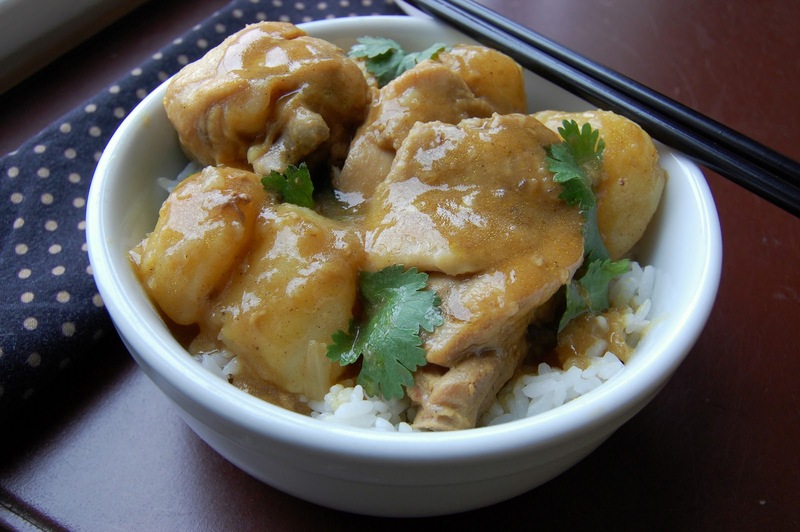 Saucy curry chicken with big chunks of potatoes, over rice. So comforting on a rainy Seattle day. 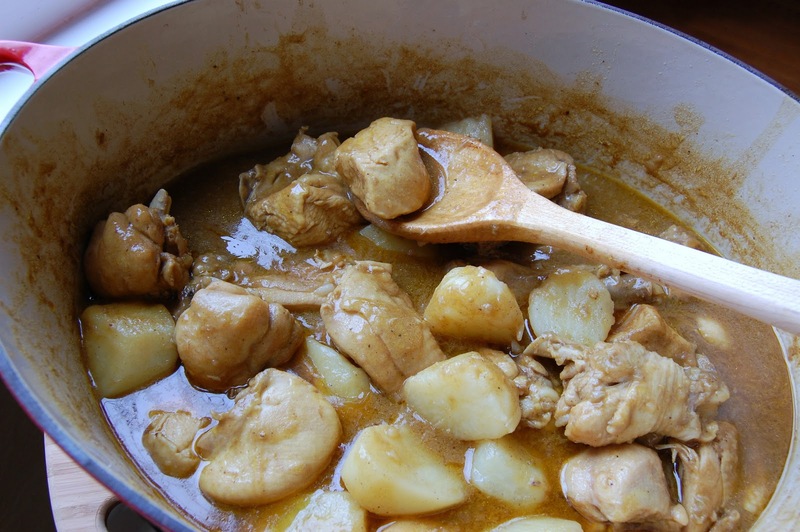 Even though the calendar says “goodbye winter”, the Seattle weather forecast for spring always says “lots of curry chicken days ahead”! A Chinese recipe with potatoes? There aren’t many. 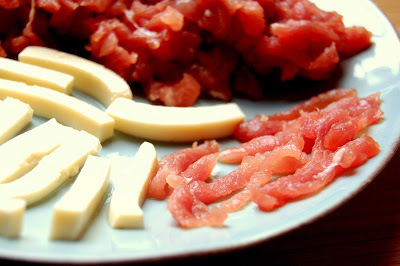 But here’s one that fulfills my occasional need for some meat and potatoes comfort food. It’s hearty, but light, because it uses chicken, basking in a flavorful, golden curry. The sauce is so plentiful, it’s almost like a stew. 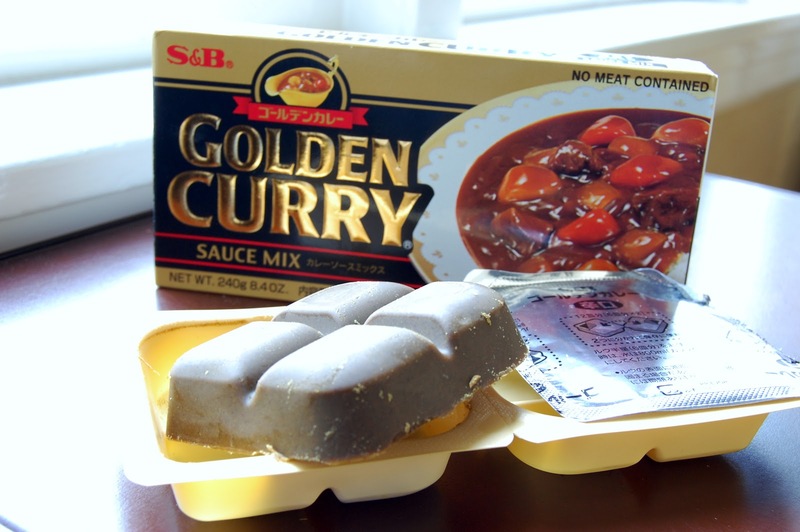 As a kid, I remember how the exotic aroma of curry would infuse the whole house when my mom made this. I would smash up the softened potato chunks with my fork, and let the puddles of spicy curry gravy soak right in. Even though there are potatoes in this dish, we always ate this with steamed white rice. A bit of a carbo overload, I know, but remember my dad’s rice addiction? (Never a complete meal without rice!) Old habits die hard, so I still like this over rice. Once you taste the sauce, you’ll understand why. Mom used to make this dish with a homemade concoction of curry powder, coconut milk and spices. However, she recently discovered an incredible packaged Golden Curry Sauce at the Chinese grocery that cuts the preparation time in half, without sacrificing a drop of flavor! 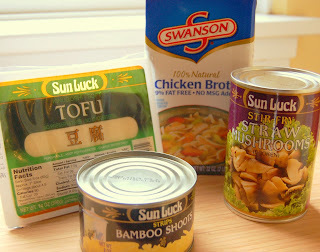 Go to “99 Ranch Market” (22511 Highway 99 in Edmonds, WA 98026) and stock up. You could probably find this at Uwajimaya, too (just take the photo of the box, pictured below, with you). Note: the photo on the box does not reflect how the sauce will look – it’s not brown, it’s golden (like in my photos). *NOTE: This recipe is slightly different from the original Lo-Mein recipe, which calls for 1 pound of dried Chinese noodles. Since the fresh noodles come in 2 pound packages, I adjusted the recipe accordingly. Also, since the fresh noodles are thinner, softer and therefore absorb more flavor, they don’t need as potent of a sauce mixture. Cooking instructions for the noodles differ, as well. Pay attention, or you will end up with soggy noodles! This is what the package of fresh noodles looks like. Find it in the refrigerated case at Tsue Chong Co., aka “the noodle jail.” If you don’t see them, just ask. 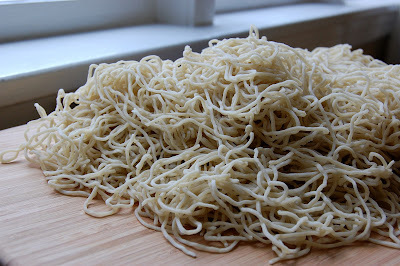 Oodles of noodles! After you separate and untangle the vacuum-sealed package of noodles, your mound of noodles will look twice as big. 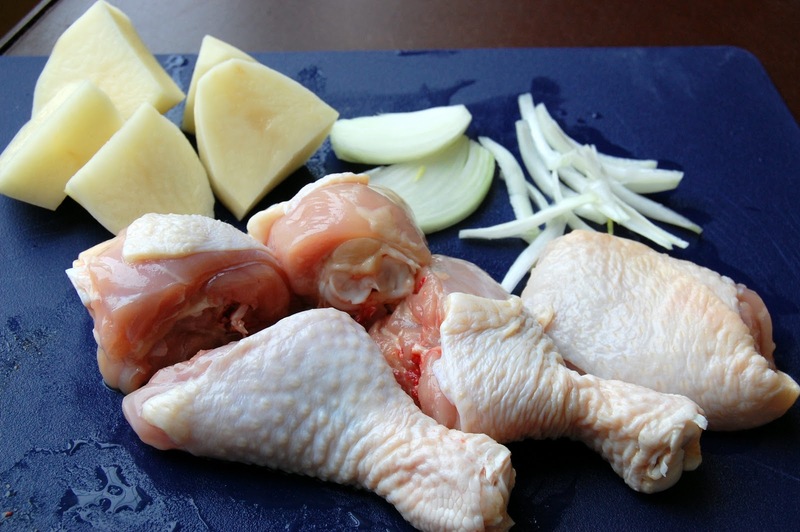 Trim off excess fat from chicken thighs, and cut meat into 1/2” pieces. Place in a shallow bowl. Sprinkle corn starch on chicken and turn to coat. 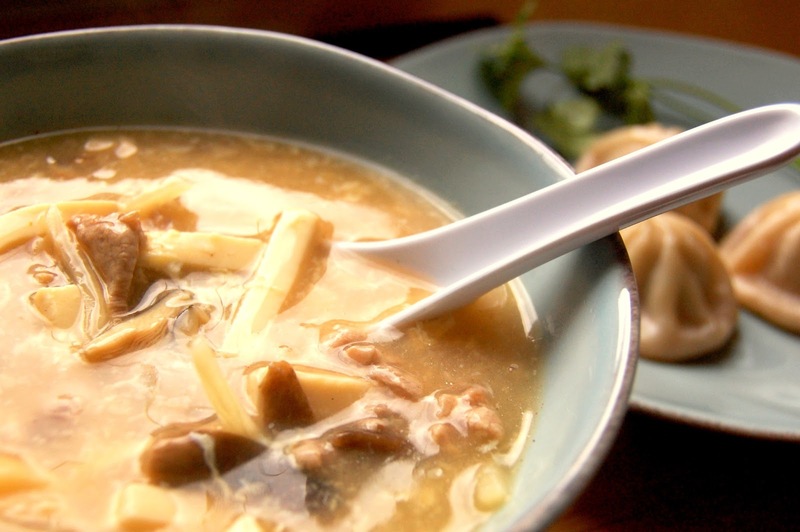 In a small bowl, whisk together 5 tablespoons soy sauce and 2 tablespoons oyster sauce. Pour over chicken and turn to coat. Set aside. In a large stock pot, bring 5 quarts of water to boil. While waiting for water to boil, open package of noodles and carefully separate and untangle the noodles(when they are vacuum sealed, the noodles tend to clump and stick together). Your pile of noodles should look twice as big as when they were in the package. Gradually add noodles to boiling water handfuls at a time; stir carefully (preferably with wooden chopsticks) every 20-30 seconds, and cook 4 minutes (water will not re-boil). Do not overcook! Drain noodles in a colander, and rinse thoroughly with cold water. Shake out excess water completely. 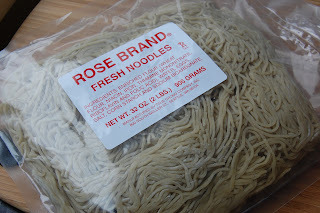 Transfer noodles to a large, deep dish. In a small bowl, whisk together the remaining 3 tablespoons soy sauce, remaining 6 tablespoons oyster sauce and sesame oil. Pour over noodles and toss to coat evenly. Set aside. In a large wok or sauté pan, heat 2 tablespoons of oil over high heat; add chicken and marinade juices, stir-fry until 90% done (about 5 minutes). Remove chicken from wok into a clean bowl and set aside. Add remaining 2 tablespoons of oil to wok; add asparagus, sprinkle lightly with salt; stir-fry until heated through (about 1 minute). Add chicken and juices back into wok. Continue stir-frying for 2 more minutes, or until chicken is completely cooked. Pour over noodles, toss gently and serve with Sriracha Hot Chili Sauce or Hot Chili Oil on the side. NOTE: *This recipe can be made in advance and refrigerated. To re-heat, cover tightly with aluminum foil and bake at 350◦ for 15-20 minutes. **You can also vary the toppings. 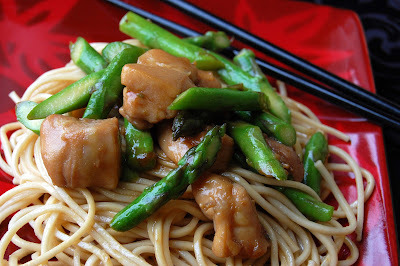 Instead of chicken and asparagus, you can substitute the “Stir-Fry Beef and Broccoli” or “Shrimp and Peapods” recipes from my other postings. Just prepare the noodles as indicated in this recipe, and pour the alternate stir-fry recipe on top of the noodles. Get ready to say “hands off” when you make this one! My oldest sister whipped up these ribs for my dad’s birthday celebration last weekend, and they barely made it to the dining table. While the glistening racks of baby backs were resting on the cutting board, my other “not-so-helpful” sister (what a surprise) snuck in and hacked off a rib to sample. After that, the flood gates were open and five or six others followed suit (including myself!). Even the younger kids were reaching for the carving knife to kipe a juicy rib. When my mom makes these, she uses country style spare ribs, but I prefer the baby backs. Either way, it’s ridiculously easy. And your house will smell incredible! The sugar in this marinade creates a rather tasty charred edge! Cut rack of ribs into two equal halves to fit into a gallon-size re-sealable plastic bag. (Use two bags if both half-racks don’t fit into one.) Whisk together sugar, soy sauce, hoisin sauce, wine and salt. Place ribs and marinade in plastic bag, seal and turn to coat the ribs evenly. Refrigerate overnight, for up to 48 hours, flipping bag 2 to 3 times to re-distribute marinade. 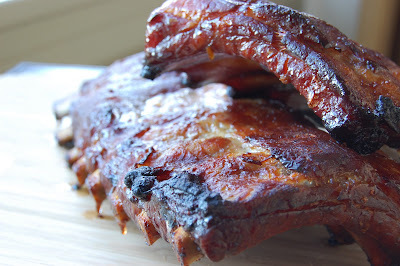 Take ribs out of refrigerator 20 minutes before baking. Preheat oven to 400 degrees with rack in middle. Line a 17” x 12” x 1” baking pan with heavy duty aluminum foil. Place ribs on pan meat side down; pour remaining marinade from bag onto ribs. Bake for 35 minutes. Turn ribs over; baste top of ribs with pan juices, bake for 40 more minutes, until meat is browned nicely and edges start to char. Let ribs stand for 15 minutes. Transfer to work surface and cut racks between bones into individual ribs; serve immediately. Mom's best friend, my "Aunt Suzanne" (she's not really my aunt, but in our Chinese world, every close family friend is called "Aunt-something" or "Uncle-something") taught her how to make this dish. And then my mom taught me. 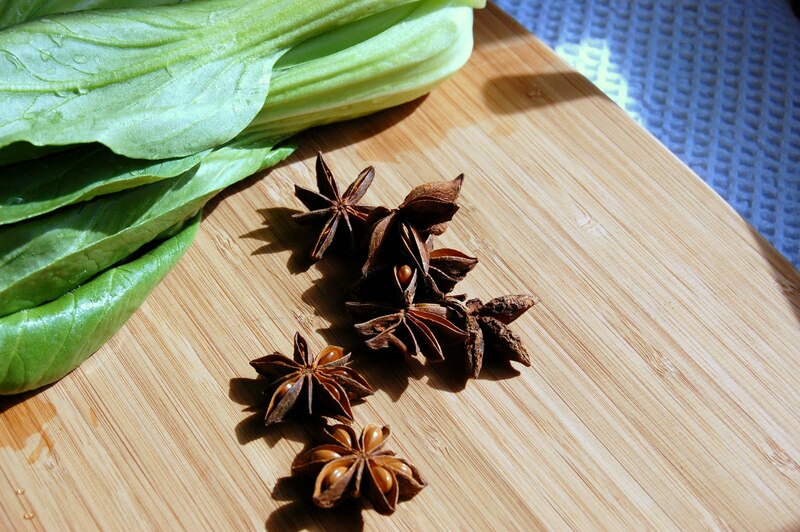 This recipe is a family favorite in both our Chinese households. Aunt Suzanne's son (who I guess is my "cousin", but not really), makes it at least once a week. I especially love it because the natural juices from the tomatoes create a luscious, rich sauce with the marinated flank steak. I'd put this one in the "comfort food" category, for sure. Once again, fire up loads of steamed rice because the gravy is to die for! Wedges of red, ripe beefsteak tomatoes give this dish a flavorful and saucy personality! Stir-fry some baby bok choy or make Chinese broccoli with oyster sauce (both previously posted) to complete this meal. Core and slice tomatoes into wedges, about ½” each (or 16 wedges per tomato). Heat vegetable oil in a large wok or large sauté pan over high heat. Add the flank steak to the wok and stir-fry until the meat is cooked halfway (the meat will look half brown-half red), about 2 minutes; remove meat from wok. Add tomatoes and stir-fry until soft and tender, about 3 minutes. Return the flank steak and all its juices back to the wok; add salt; stir-fry until meat is cooked through and sauce starts to thicken, about 2-3 minutes. Serve with steamed white rice or brown rice.